Learn how to practice yoga using a chair for support. Increase your energy and strength, improve your concentration, flexibility, balance and sense of peace. "Yoga works at work", at hone, on airplanes, in a wheelchair, pre or postsurgery, with an injury or chronic illness and at all ages and stages of life. You can improve your overall well-being with these yoga exercises for the body, mind and Spirit. To order, click on the links below each book. Also available​ at the Bahamas Yoga Retreat, NYC Sivananda Yoga Center, NY Sivannada Yoga Ranch, CA Yoga Farm Ashram Boutiques, Boulder CO Bookstore, Yoga Journal Events CO and NYC Expo, San Francisco Sivananda Yoga Center and Integral Yoga Institute. Email me for wholesale orders. Learn how to practice yoga using a chair for support. Increase your energy and strength, improve your concentration, flexibility, balance and sense of peace. "Yoga works at work", at home, on airplanes, in a wheelchair, pre or post surgery, with an injury or chronic illness and at all ages and stages of life. You can improve your overall well-being with these yoga exercises for the body, mind and Spirit. Yoga is for everyone! Click to order or view all books. -ebook & printAhimsa means nonviolence. Learn how to eat and cook with compassion. Eating a vegan or vegetarian plant based diet not only helps animals, but improves our health and the environment. 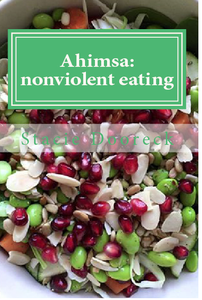 The book has useful information, healthy and delicious vegetarian and vegan recipes, yoga sequences for healthier digestion and overall health, breathing practices and simple meditations for inner peace. The print edition of Yoga for Everyone! is now available at the Bahamas Sivananda Yoga Reterat Ashram Boutique. Click to order or view.